Johnny Doc case: Which city councilman needed a soda tax ‘hug’? Kenyatta Johnson, sources say. 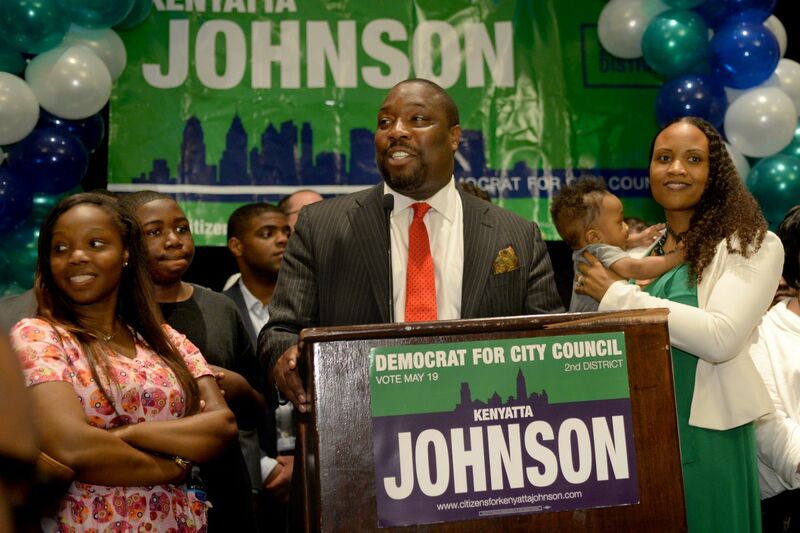 Councilman Kenyatta Johnson, pictured in 2015 with his wife, Dawn Chavous (right), and their son, Isaiah Mandela Johnson. One of the more intriguing episodes described in the federal indictment of labor leader John Dougherty and Democratic City Councilman Bobby Henon involved their behind-the-scenes push to build support for Mayor Jim Kenney’s proposed soda tax in 2016. Prosecutors haven’t named the Council member, nor has Henon or Dougherty. Sources familiar with the matter but not authorized to speak publicly identify him as Councilman Kenyatta Johnson. Johnson hasn’t been charged with a crime, and the indictment does not say that the unnamed Council member sought the payoff Henon and Dougherty allegedly spoke about. Nor does it say if they followed through on the offer. Moreover, Johnson’s June 2016 vote in favor of the 1.5-cent-per-ounce tax on sweetened beverages didn’t make a difference — the measure passed 13-4. A statement released by his office disputed Johnson was the councilman cited in the indictment and included his own denial of wrongdoing: “I never sought to obtain a benefit for any family member as a result of that support, either from Councilman Henon or anyone else,” he said. But the “hug” described in the 116-count indictment stood out for more than one reason. The allegation was typical of the kind of backroom horse-trading involving Henon and Dougherty that prosecutors say was routine, and that still could work in City Hall. It also signaled how the investigation and any looming trial could expose or entangle any number of heretofore unidentified players in the long-running probe. The indictment says two dozen unnamed people benefited from embezzlement, theft, and other crimes allegedly committed by Dougherty and others. (The Inquirer has already identified Pennsylvania Supreme Court Justice Kevin Dougherty as one of the alleged recipients of the goods or services paid for with stolen funds from Local 98 of the International Brotherhood of Electrical Workers.) Any or all of them could potentially become witnesses. For Johnson, 45, it could just mean more heat. The two-term councilman from Point Breeze is already under FBI investigation for his role in the bargain-rate sale of city-owned land to one of his childhood friends. And, like most every Council member, he’s up for reelection. If Johnson’s wife, Dawn Chavous, did want or need a “major-league job,” as Dougherty has allegedly described it, she already had a wide network to call on. The 39-year-old has bona fides as a consultant in both the political and education worlds. She had been a longtime consultant and campaign manager for State Sen. Anthony Hardy Williams, an avowed critic of the soda tax who is considering challenging Kenney in the Democratic mayoral primary in May. (Williams has been a mentor for Johnson.) Chavous also worked last year on the congressional campaign of Dougherty ally Rich Lazer. She serves as president of Sky Community Partners Inc., a nonprofit that says it provides scholarships to independent schools under the state’s Opportunity Scholarship Tax Credit Program. In the months before and after the 2016 soda tax vote referenced in the indictment, Chavous did work for at least three clients who sought or considered pursuing city contracts, records and interviews show. None had obvious ties to Dougherty, Henon, or Local 98. In the statement, Chavous said none of her consulting work had anything to do with those companies’ pursuit of soda tax-funded contracts, an assertion confirmed by representatives from each. One, a pre-K provider run by her mother, Barbara Chavous-Pennock, won preliminary approval from the Kenney administration in October 2016 to receive city funding to enroll more 3- and 4-year-olds. Her school, Somerset Academy, appeared on a list of 61 pre-K providers vetted and cleared to receive a total of $10.2 million in city funding. Ultimately Somerset did not get a contract, after officials determined it did not have the proper state operating license. The school has since received a license and is eligible to contract with the city going forward, Kenney administration spokesperson Deana Gamble said. Chavous-Pennock did not respond to written questions about what role her daughter played as a consultant for the company. In her own statement, Chavous said she worked for her mother’s pre-K provider for a few months in 2015, before the soda tax was passed. Another Chavous client, Brightside Academy, a Pittsburgh-based early education provider, won a city contract that provides funding for 160 kids at Brightside sites in Philadelphia, at a rate of $8,500 per student, Gamble said. It came without Chavous’ help; She briefly consulted for the nonprofit months later, according to a nonprofit representative and Chavous. A third client, the Big Sandbox Inc., hired her when it was seeking state grant money for schoolyard renovation projects in North Philadelphia. In 2017, Sandbox considered applying for a contract with the city for its Rebuild initiative — a public-works project funded by the soda tax to invest hundreds of millions of dollars in parks, recreation centers, and libraries. But the nonprofit halted its plans after learning schoolyard projects were not eligible for Rebuild funds, according to the nonprofit’s executive director, Jake Gaffigan. Big Sandbox ultimately won a $500,000 state grant for other schoolyard projects, with the potential for $2 million in future funding. It spent $22,000 on lobbying from October 2016 through June 2018, state records show. Gaffigan said those expenditures were for Chavous’ services. He said Chavous “was a tremendous help for one of our fund-raisers in Philly” and helped lobby at the state Capitol as well. But Sandbox suspended its services with her last summer, Gaffigan said, when the nonprofit received a subpoena from federal law enforcement requesting all records and communications with Chavous. It is unclear if that subpoena was related to the Local 98 probe; Gaffigan declined to discuss it. As for the soda tax, prosecutors say Dougherty and Henon decided during the May 2015 Democratic primary that Henon would threaten to propose the tax as a means of exacting revenge on the Teamsters’ union, which he blamed for airing a TV commercial that had portrayed Dougherty in a negative light. “They’re going to start to put a tax on soda again and that will cost the Teamsters 100 jobs in Philly,” Dougherty told another Electricians union official in a phone conversation captured on the wiretap, according to the indictment. Henon was reelected that November, and Kenney was inaugurated in January 2016. Shortly thereafter, the indictment says, Dougherty told the mayor’s office that Henon would support the tax. Acting at Dougherty’s direction, Henon began rounding up votes, prosecutors say, which is when the “hug” conversation was caught on tape. Staff writers Mark Fazlollah and Claudia Vargas contributed to this report.